I spent the past week in Washington, DC at Influence 2015, the annual convention for the National Speakers Association. It was a great opportunity to connect with other speakers, share my thoughts on the value of what we do, and, of course, learn a ton of great things. In a session on Commercializing Thought Leadership, Neen James suggested creating a model for your content. There are a number of benefits to this, including enhancing personal branding and building credibility, but the most important benefit is that it can clarify thinking. 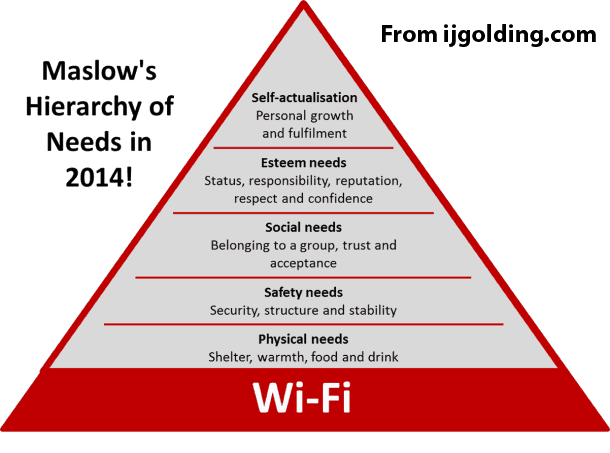 Think about Maslow’s Hierarchy of Needs and how informational this single graphic is (now with WiFi!). Roger was part of Jeffrey Hayzlett’s morning session that included Q&A. What impressed me about Roger was his ability to answer questions through analogies. Roger spoke of the value of Virtual Presentations and, when addressing concerns about their typically one-sided, impersonal nature, he reminded us that we’ve experienced that for years with TV and Radio. That simple connection clicked in my head to help shift my perspective on doing things virtually. Immaculee delivered a talk during the opening general session of the conference. It started with a short video, then she came out, took her spot on stage, and began to speak. And for the duration of her talk (I’m not entirely sure how long it was as it flew by, but at least 30 minutes), she didn’t move anything except her mouth as she told her story. There were no slides, no big gestures, and no audience participation. And yet we all listened. Because her story was engaging, powerful, and moving. She told the story of surviving genocide by hiding in a bathroom for 91 days and what it was like coming out of it all as a different person. Compelling slides, big movements, and audience activities can certainly make for an engaging talk, but there’s nothing quite like an incredible story told by an incredibly storyteller. Laurie led an incredibly useful breakout session on a deep-dive into sweetspot pricing. She covered a number of tactical things to do, but my biggest takeaway was more strategic. Laurie said her goal is 2-to-1 speaking; at every event she does she wants to get 2 more engagements out of it. Translation: be so good that you get future bookings from people in the audience. There’s still strategy that goes along with this (such as giving out Tent Cards that have a spot for people to check “I want to hire you”), but it all starts with being great on stage. The opening night started out with a bang with a great presentation from Chef Jeff, a former drug dealer and prison inmate who’s now a successful chef, entrepreneur, speaker, TV personality, and more. He told the tale of how he ended up in prison and ultimately became a hustlepreneur, turning Federal Penitentiary into Federal University. The number one ingredient to success: hard work. Where you’ve been is certainly a part of your story, but what happens next is entirely up to you to write, and you write it through hard work, focus, and dedication. Bruce, a fellow NSA-NYC chapter member, is known as the Ethics Guy. So it’s no surprise that he led a session on Ethics. With the help of Gerard Braud, Bruce created a Family-Feud style game to teach the value ethical leadership. They would get a group of people up and ask them an ethical question (such as “Would you get on a flight and do an event if you knew you had the flu?”). The participants would guess, there’d be discussion, and then Bruce would give his perspective. When giving the reasoning behind what decision to make, Bruce returned to 5 Principles. Every. Single. Time. The 5 Principles? Having a set of principles can make the decision making process easier—you return to each time and use that to determine the course of action. Not “do whatever is easier” or “whatever makes more money” but do what should be done based on your principles. Mark’s closing keynote of the conference is one of the Top 5 speeches I’ve ever seen live. It was absolutely brilliant in terms of message, pacing, humor, and poignancy. 2 hours after delivering a keynote to 1700 people in a packed room, Mark took part in a breakout session for less than 100 people where he deconstructed how he prepared for the talk. In both sessions, Mark started off with saying thank you to the audience, showing gratitude for them just being there. A man who has delivered over 1,000 talks, is a CSP and CPAE, and had just given an incredible keynote, was still thankful to a room full of strangers. It didn’t matter the size, nor the context, of the group, Mark was appreciative that they were willing to listen. Damian delivered a masterful impersonation of Bill Clinton at one of the evening events, as well as value-packed breakout session on re-invention. He was also one of the funniest, most authentic people I met at the conference. He shared his honest thoughts and wasn’t afraid to speak his mind. He’s also been around for awhile. He profoundly told me that the greatest value of a conference such as this isn’t in the general sessions or in the breakouts, it’s in the hallway (and the restaurant and bar). Basically it’s where you connect with people, build relationships, and learn from each other. He was right. It was in those places that I met people who gave me great insight on my own business, connected me with potential clients, and more than a few who became friends, which is helpful in a business such as this one. Yes it’s a little weird and a lot narcissistic to gain an insight from yourself, but here we are. I delivered a session on the ROI of what we do, quantifying the value speakers provide to organizations. It was a presentation chock full of numbers, something I’m passionate about. After delivering the talk, I had a number of people tell me how much they enjoyed it. In a VOE recording session, the sound guy said he’d never hear anyone talk about what I was talking about in his 21 years of experience. One woman stopped me later in the hallway to tell me it was the most valuable session she attended the whole conference. She didn’t say funniest or best, she said “most valuable.” As an engineer, that’s the best compliment I could ever receive. It all came from sharing something that is my passion and my strength: thinking about numbers and how we can use them demonstrate our value. What came more naturally to me was brand new for others. Perhaps the biggest insight was a reminder that we’re all human. From a Hall of Fame Speaker who has made over a million dollars from speaking to someone who started their business last week, we’re all human beings. And at a conference like this, you get to meet those people as human beings. I talked with Mark about stand-up comedy, with Immaculee about NYC neighborhoods, and with Laurie about interesting audience questions. I saw mainstage speakers working out in the gym, big name speakers waiting at the end of the line for food, and speakers of all experience levels rocking it on the dance floor. No matter their skill level, topic, years of experience, or dollars earned, they were accessible, open, giving, and sometimes a little drunk. 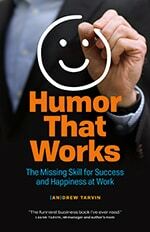 We sometimes get enamored with those we perceive as experts, professionals, or celebrities. And while those who work hard and develop mastery in their craft should be celebrated, they shouldn’t be put up on an unapproachable pedestal. Because at the end of the day (and end of the conference), we’re all human. Needless to say, Influence 2015 was tremendously valuable for me as a speaker and as a person. If you’re interested in getting in on the action, be sure to sign up for Influence 2016 in Phoenix, AZ next year. Wow. Good stuff. I just added some new things to my own list of takeaways. Thanks! This is a very well written article and I appreciate being included in your list of top take-aways.